It’s time for the Real Estate Happy Hour Show with the two most Popular Visionaries in all of Real Estate, Collier Swecker and David Arnette. 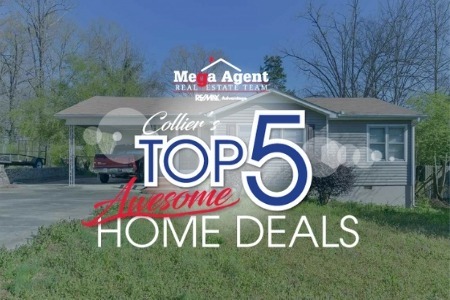 On today’s show Collier and David are talking about 15 Awesome Real Estate Negotiation Tactics, the One Investment Warren Buffet says he wants vast wealth to be put into when he dies, Millennials Aren’t Living Alone, and Updated Interest Rate News. 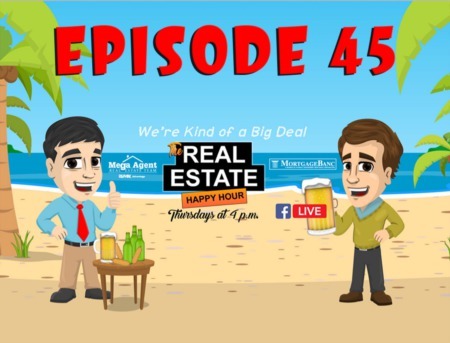 Join us every Thursday at 4pm for the live show on Facebook Live or watch or listen to the Real Estate Happy Hour on replay or listen to the podcast that can be found on Apple Podcasts, Google Podcasts, Stitcher, Spotify, and Tunein Radio. Collier: All right! It’s Thursday, it’s 4 o’clock! It’s time for the Real Estate Happy Hour! (Rock music in the background).? ?David: The number 1 show on Facebook at 4 o’clock on Thursday! Collier: About real estate based in Birmingham. Collier: That’s why we’re number one. David: Hey, if you get specific enough we’re the number one JD Power ranked. Collier: Unfortunately, that JD Power is your cousin JD Power. Collier: From your mom’s side of the family, but anyway welcome to the Happy Hour! Man, how is your week doing? David: Thund, my week is thunderstruck. Collier: It is thunderstruck, great tune by AC/DC. David: it’s the end of the month, it’s been busy, and so we are, today’s the last day, the month’s March we’re starting over March 1st. Collier: And it’s been great finally, you know these, these closings are starting to pick back up again, people out there are looking again. Collier: The inventory is still low. David: But gained a little bit aren’t we? We’re gaining a little bit? Collier: Little bit, very little, but, but there’s always hey like everything else, there’s always gonna be somebody wanting to buy and there’s always gonna be somebody wanting to sell. David: Absolutely! And that’s why we’re talking huh? Collier: That’s why we’re talking and that’s why we’re for the hour of the Real Estate Happy Hour! Anyway, hey man, we’re only about what, how far away from our cruise? Collier: You and I are going on a cruise! Collier: Takes the show by the way! That proves we’re a big deal. David: Oh yeah, yeah! At the end of the month, end of March. David: Gonna be sailing the seas again! Collier: Brand new Celebrity Edge! That’s gonna be a killer ship. David: Yeah, brand new ship Tortolo Saint Martin. Collier: Tortolo, that’ll be Tortoa. Collier: Yep, yep, then what? Saint Martin. Collier: And then San Juan? David: (Inaudible due to crosstalk). Collier: So hey, so hey, we’ll be live from somewhere in the world. David: Somewhere, it’ll be good. Collier: It’ll be good times, so we’ll looking forward to that and anyway man! I’ll tell you what, we’ve got some good stuff today, we’ve got some negotiation tactics and we’re gonna talk about hey, how can, how can you enhance the offer if you’re a buyer and then how can you be a better seller and, and get a better deal if you’re on that side. David: Yeah absolutely, we’re gonna talk a little bit about interest rates, I mean we’re you know we’ve got a lot of the real estate negotiation strategy, so the top 15 from the pros, we’re gonna talk a little bit about some, some stocks, we’ve got actually a chart here, we’ve got to look at on one of your favorites, Carvana. David: Right? But let’s just kick it off with rates real quick, a little bit less than 4 and a half, about 4.3, 4.4 on a 30-year fixed, 15-year fixed, it’s about 3.8 roughly. So, that’s a Freddy Mark, Freddy Mac. David: Freddy Mac mortgage market survey. Collier: It’s a new one. David: Man, pulled up an article today, more than a third of millennials are still sharing housing. Collier: And, and that’s with, just with their parents, it can their parents, relatives. David: Roommates, anything like that right? As compared to, you know several years ago that, it’s a much lower number of home ownership in that age group. Collier: Now, was there a difference in men and women? David: No, not that it, not that it pointed out, but it singled out the age group of 25 to 34. David: So as a comparison back in 1990, the, I guess the home ownership trend was closer to your late 20’s. David: Ok? And now they’re saying that’s moving into your 30’s, early to late 30’s, that home ownership move. Collier: And, and one thing I read not in this article, but the other day was that a lot of it deals with relationships going bad, a lot of moving in with each other early. Collier: And so what happens when, you know ‘cause it’s a great idea to move in with your boyfriend or girlfriend that you’ve been dating for 3 weeks, so it’s just a phenomenal idea. Collier: To merge out everything, just be like you’re married. Collier: And, and, and then it breaks up, when you break up at 7 weeks right? You, you have nowhere to go and obviously mom and dad are gonna be there right? Collier: I think that plays into this. David: Yeah and I think the biggest, the biggest takeaway also was that in comparison 1990, roughly about 20% of young adults 25 to 34 were living with parents, relatives, roommates or sharing housing and that number has almost doubled up to, you know almost 35%. David: Now, that are living with parents, relatives, roommates, they’re sharing housing so. Collier: I mean I love my parents, I just don’t know at age 32 if I really wanna live with ‘em. Collier: They don’t let the air conditioner run long enough and you know there’s a lot of things you know? David: There’s a lot, that’s, that’s, that’s number 1? David: That’s your number one reason? Collier: The air conditioner yeah, ‘cause he used to tape the air conditioner thing, you know like so I couldn’t move it. Collier: And then I learned techniques of you know how to do it, so he wouldn’t know, but then he could feel the cold air. Collier: So it didn’t really work, but anyway! Collier: I, I digress, but, but that is interesting and what’s fascinating is that, that generation is so different! Collier: And even the generation coming in behind them, so. David: I think you know it’s the first time, when we heard rumblings of you know the millennial population not being as interested in home ownership, I know we’ve heard a couple of things like that recently, I think. Collier: Oh, it’s in the news! David: You know I think I would understand it for a bigger city, where you have like a transient professional that wants to have the ability to wherever, all right you know I’m, I’m in a career and any time I wanna pick up and go to Los Angeles, New York, Chicago, wherever, wherever my job might take me. I, sometime I think Birmingham is, is not made up of that. Collier: It says that and we’re gonna talk about that in the coming weeks, about some of these big I don’t know, big picture outlooks. Collier: Because it’s not made up, it’s, it’s I mean there’s a lot of millions of dollars. David: Yeah, I think it’s definitely a trend that’s gonna be growing, I think you’re gonna see it more in the bigger cities, I think you’re still gonna have a lot of cities like Birmingham that’s gonna be family focused and they’re gonna be more interested in purchasing a home and things like that, but. Collier: Gosh, I hope so. David: Definitely, a trend that is gonna be on the rise I think. Collier: We’ll see, I mean one of the big things is you know from pricing to everything, everything comes here last, I mean we’re never gonna get in an out burger in our lifetime here right? I mean it’s just never gonna happen, even if they did expand. Collier: ‘Cause we’re gonna be last! Collier: Well Missis, then there’s Mississippi and then there’s other place, but anyway I digress, anyway! Let’s walk through a good article I found, you know about the top 15 real estate negotiation strategies from folks around the country and I thought it’d be fun to take it, ‘cause really they’re all good, good ideas. David: Yeah, yeah, absolutely, number 1 is including esc, escalation clause to make your offers more competitive, now this is a funny example that they use here in the article talking about, you know let’s go ahead and write it in that if you get another offer I’ll, I’ll go up 10,000 dollars over whatever you get. Collier: Well and we do that occasionally, what we’ll say is up to a certain amount though. Collier: So we’ll say, we’ll take 3,000 over your highest offer up to 210,000, meaning I will go up to 210,000, I’m not going a dime. Collier: But, but I will pay you more than this other offer. David: Yeah obviously, I mean and, and it makes your offer stand out obviously so great idea there, to, to get your offer a little ahead of the rest. Collier: Ab, absolutely and the next one is assess the type of negotiation and identify value creative moves. Hey look, if you’re negotiating whether you’re a buyer or a seller you need to find why of the other side, I mean I think that goes with almost anything we don’t teach negotiation anymore, if it’s gonna be a win-win you’re not gonna have a deal. Collier: And I don’t care whether you think you’re gonna be a hard rear-end about it or whatever, you still gotta make that, that folks, those folks are gonna wanna win. David: Yeah, yeah and then you kinda, kinda have to identify you know what the other side is wanting out of it and try to cater to that a little bit, as much as you can to get what you want. Collier: Well, I think the key is what’s valuable to that person may not be valuable to you. David: Yeah and I think, you know the example that they’re talking about here is you know pricing it out of the market, so obviously the seller is going to have a higher opinion of the value than the buyer is right? And so the seller might be comparing it to last year’s market and, and the buyer’s looking at current market so, you know you gotta be, you gotta be careful going in, if, if the seller has unreal expectations, you gotta, gotta treat that carefully. Collier: Well I think the other thing, is to look at you know kinda gage, you may find out that one of the big, if you talk to the agents and find out hey does that? You know they’re buying a big piece of property and they, and the husband’s just like man, I cannot push mode this, this grass I’ll be dead! Collier: I’m working two jobs! Collier: I can’t do it, no! But you have a rotten lawnmower, that may be the kicker right? Collier: Let’s throw that in, in other words find out if that’s the big lie and ‘cause you’re really gonna kick yourself when you don’t, if for some reason this deal falls suit all you had to do was leave your merry lawnmower. Collier: But, you can’t use it in your next house ‘cause you’ve got a garden home anyway. David: Absolutely and you know in the example, they’re saying you know on a 600,000 house, let’s say the market really is 500 but if you go in 500, the seller is just gonna be completely turned off, so maybe you, you, you offer him 525 and say you know what? This might not be what you’re looking for, but why don’t you hang on to it if you get any other offers in the next 60 days that are better then. Collier: And keep following up. David: Let me just hang out there. Collier: You’re, I mean you’re exactly right and but at the same time, folks remember people just don’t just throw off if there’s a lot anymore, people go well they’ll just make me an offer! Not really (laughing), if you’re not a deal that yeah, yeah they might make you an offer, but you’re not gonna like that offer, the people that just make offers generally you don’t like those offers. Collier: ‘Cause they’re bad, now next one is, you know take that fiduciary obligation, very important, see it very seriously and really you know that really goes to the agents, making sure that your agent has your best interest in mind. And quite frankly, you don’t really wanna be working against if you will, negotiating against it’s not taking their client’s best interest in mind. David: Yeah and I thought it was very interesting the way this was put, was, was basically kinda related to, to dating right? That there’s an art to the negotiation, so they’re basically saying and it talks about nothing poisons a deal faster if you take the first offer, if there’s no negotiation then the buyer thinks that they offer too much, the seller thinks they listed for not enough right? So, take in the first offer and, and no negotiation at all, just psychologically makes it worse right? Strange. Collier: Absolutely! And you know (very short pause), this is another one that is interesting, where they, they say you know get the other side or even yourself, you know if you’re the agent out there talking to say yes and make it their idea right? So in other words, the example they give is the buyer’s asking you to pick up the closing costs in order to close the deal; you’re free to say no if you want to of course! But, would you be willing to consider it in other words, when you’re negotiating with somebody right, you, you, you throw it out there but hey, you do the old pull back right? David: Yeah, yeah, you might, you might not be interested in this, so this might you know might be something that you don’t wanna do, but. Collier: Well, I give you a case in point. David: You can think about it. Collier: I just came from a closing where this happened, where the seller wanted to sell his house, the seller also got to the part, where the buyer had to have the taxes paid the difference between the home steady, and non-home steady rate paid the difference just the difference. Collier: So, be crafty in how you say it. David: You just have to understand what the, what the intricacies of the deal are right? So, you don’t wanna, wanna blow up the whole thing over what, 500 or 600 dollars in taxes. Collier: I mean yeah, absolutely, people would do it all day and then twice on Saturday, I mean you know? David: So, next one, next one, negotiate from a win-win perspective. Collier: Absolutely, it’s focusing on those solutions, making, making, finding out what we talked about earlier right? The other side and solving the problem for both sides right? David: Yeah, this, this time out there they say agents come into the negotiation thinking it’s a battle, it’s like they’re coming in. David: With a bad attitude, it’s like you know I gotta win, I’ve got, I’m coming in with what I want and I’m gonna win this, this argument right? It’s not, it’s not about that it, it needs to be about both sides accomplishing, you know there’s, there’s goals on both sides, I mean you’re not gonna get everything right? But let’s, let’s, let’s, let’s go with a win-win, so both sides get part of they want. Collier: It’s a give and take! And, and, and just like what happened today you know it’s fun, not getting political here but talking about, like they were talking to some experts on this Trump and Kim Jong-Un issue and why Trump got up to leave. He can, not like Trump, but it is a, if he cannot get a win-win, I think Kim Jong-Un thought it would be hey, win for him and he’d send the bad guys home, which was us right? And so, Trump just gets up and leaves, that’s a negotiation tactic ‘cause he can’t, he, he knew he was not gonna have an agreement, if you can’t have a win on both sides. David: Yeah and you know, you know Trump obviously is, has a lot of experience negotiating. David: So he’s, you, you whether you like him or not he’s not dumb, he knows what he’s doing when he got up and walked out, he knew what he was trying to accomplish. David: He knew the message he was sending, maybe you think he’s playing games or whatever and maybe he is, but. Collier: That’s part of negotiation at times. David: Yeah, yeah, at times it is. Collier: ‘Cause I’m trying to mooove you towards my opinion. Collier: ‘Cause and he’s that, you know somebody like him is thinking down the road 3 or 4 months from now and that’s too often in our negotiate, not you and I, but in a situation we see in the real world, is that to me people want it right now, but maybe you need to wait a, maybe it’s a couple of days from now that saves you 10,000 dollars or whatever. But, next one always use market value instead of asking, instead of the asking prices you’re starting for, I agree 1,000, 100%, you know we looked at it one time recently, we looked at beginning list price of homes on the market and then, and home sellers were getting about 92% of beginning list price, rear wasn’t when it went on the market, but they were getting like 98 or more percent of any list price. What was the list price when it went under contract? In other words, if you’ve got, if you go ahead and just list it where it needs to be priced, you’ll get it sold and you’ll create a lot of less heartache for yourself. David: Yeah absolutely and I mean this is just, this is just research that’s gonna be done on the, the house by your realtor, the realtor that’s representing you, they’re gonna pull comps, they’re gonna pull you know eveyrhing about the neighborhood, the square footage, the aspects of the home that they can compare to other sales as, as what we’re talking about. And that’s how you’re gonna look at market value instead of just looking at the asking price of what the other realtor put on it and that’s where you start, you know a lot of people talk about, you know they wanna go in and just make a low ball offer right? And that kinda turns the seller off, so that doesn’t really. Collier: So, you’re talking about from the other perspective now, from the buyer’s perspective. David: Yeah and, and, and what they’re trying to do, they’re trying to get a deal, but what you’re really doing is turning, you’re kinda shutting off the other side. So, you’ve told the seller that you don’t really wanna negotiate, you want to rip him off. David: Right? And a lot of times that’s what happens, they don’t see this as an opportunity for us to work something out, they see it as you know a low ball offer, I`ve seen them come back at. So, you gotta list price, byer comes in low balls it, seller counters this price, so we got nowhere. Collier: No one, but sometimes I don’t blame ‘em, you know we, we were talking a little bit earlier, you know talking about win-win and, and, and you know, you know assess the value, identifying modals, those type of things. Ask those questions outside of that defined; if that’s even gonna be possible. Collier: Right? Because of you’re gonna low ball ‘em, they’re gonna find out the second they receive that offer, whether or not. Collier: That’s gonna be a deal, so learning, learn the power of know, you know, know is an extremely negative term, but it’s also a very powerful one from a positive standpoint ‘cause it can create change in the negotiation. David: Yeah and, and it’s interesting what, and I did a little bit of video about this guy Chris Voss, he was a former negotiator for the F.B.I., he talks about how people feel when they say yes and when they say no. And one of them was with, you know when they say yes they’re really kind of unsure about what they just signed on for. Collier: Yeah, what, what are my, what am I obligated to do. David: Yeah, when they say no that they’re actually more comfortable to talk (laughter), yes true, they’re actually more comfortable to talk because they just made a statement on their position and they’re, they’re just more comfortable and that’s interesting, there was a whole, there was almost an hour long talk with Goo, talks with Google. Collier: The word know would give you an hour right? Collier: Or you’ll be like that old David Spade commercial, no, no. David: But he does, but he tells, talks about how, how you know the word yes scares people. Collier: Because hold on, it’s because they’re committing. Collier: Right? Commitment I mean, just like in most millennials right? They’re obviously uncommitted, a lot of them are going married and doing all this stuff. Collier: But so, committing to something is hard! David: And how and the work no I mean, basically just means not right now or let’s figure out another way to ask the question, or let’s get some more information. So very, very interesting comment there, learn the power of no. Collier: Yep next one, use price anchoring to buy someone’s lowest price, it’s you know finding out where the, the, the parameters if you will, of a negotiation because every price negotiation has ‘em, has some window. Collier: Of possibility and probing around that question because see here’s the thing, somebody’s always gonna say a seller specially, I want 350 thousand for my house, I want it! Ok great, I’m so glad you want that, now if I were to bring you a cash offer today at 325, would you take it? Well I would if b-b-bop, well now we’ve established that there’s a possibility; it’s not that the agent or whoever else is gonna to that number. But, I think is really important for you to know where those parameters are, so that we can craft a deal around those numbers, on the flip side of that find out from the buyer and vice versa, both sides can feel each other out. David: Yeah and it never, it never helps to be you know I guess kinda stick your feet in the sand and really staunch about your position right? If you’re not gonna be flexible, it’s gonna make the negotiation tougher. Collier: Yeah, next one, learn what the other party needs from this particular deal. In other words, do you need a quick close? Do they need closing costs? Do they need flexibility on something else? David: Yeah or maybe they have to, maybe they’re trying to coordinate transactions, maybe they wanna find another house before they sell theirs and they’re at an area, so they need a longer window, maybe they need a couple of months for this, before this closed. 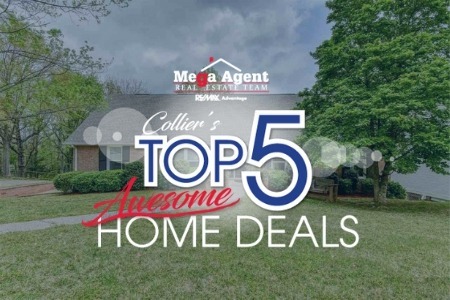 Collier: Or the seller, you really love this house and you know, but the seller really has nowhere to go and you’re willing to lease it back to them post-closing, that’s something you might want wanna know! Because you know what, otherwise they may be keep saying no to you because they don’t have any flexibility and I know this sounds crazy. Collier: Why would they be selling their house? But it happens all the time. David: Yeah and even, on the other end maybe they need a fast close and you’re like well, maybe they’ll take your offer over somebody else’s because you’re working with a lender they know and you tell ‘em yes, we can close in 2, 3 weeks, whatever it is and we can satisfy your needs on this deal. Collier: You know this is one that is interesting, ‘cause the lawyer in me hates it, but the agent in me loves it and it’s to try to negotiate everything by phone before committing anything to paper, the reason the lawyer. Collier: The reason the lawyer in me hates it is that you don’t have a contract, under most state laws I can tell you in Alabama everything revolving around real estate must in writing. Now, there are times really that, that we, again it goes back to what we talked about earlier about feeling out the other side, where will they go, all these things, but remember you’ll never have a contract for real without it being in writing. It won’t be a real contract until it is, but it, there is a lot of value in that verbal back and forth. David: And there is some stuff maybe that they can feel out over the phone and then take it to paper, you know we talked about it verbally and then you get it written up in the contract. Collier: You know is, is interesting ‘cause there is a time and place for everything and one of the best things about having a good agent, yeah I think is creating that separation barrier. But, there are very important times where if we’re special on a multiple offer negotiation or what have ya, where I want to establish a relationship between the 2 parties because it’s hard to say no to somebody’s face and when you see a real family or a real person behind these words. David: Yeah, it changes things right? Collier: Yeah, absolutely and so be very strategic with it ‘cause you, what you don’t want it to be is every time out I’m putting the 2 together, but when there’s that opportunity for a powerful moment for them to see whatever your situation is. David: A powerful moment for the seller. Collier: Your baby’s sitting there, this is gonna be the baby’s first home, man how powerful is that? Moving on. David: So, next one is keep your cards close but try and stay nonchalant, now this basically means, you know don’t be a buyer that walks in and now maybe the seller is there, you’re looking for that other, this powerful moment where you let them know that you are absolutely head over heels in love with this house. Collier: I love it! And guess what? Everybody has a camera now, so they’re listening to you. David: Right? Yeah everybody does so, you wanna, you wanna keep your cards close, try and stay nonchalant, don’t let on that you are absolutely, madly in love with this house and you’re gonna do anything you can to get it. Collier: Hey, you can tell ‘em they have a lovely house, but don’t tell ‘em that you love it so much that you’re about to overpay by 10 thousand dollars. Collier: If they’ll just give it to you. David: Right, the next one I love this one live conversation beats text and emails every day of the week, I think just in business everything we rely too much on email. Collier: Well listen, it’s, it’s, it’s a contact sport as they say right? David: Well, this is funny ‘cause he gives, he gives a, an example of this agent, Windermere Real Estate gives an example of a deal that he’s working with another agent and every they, every time he calls he has to leave a voicemail and that agent returns, hears the voicemail and texts him. So there’s, there’s no real conversation, so there’s not you know basically is saying there’s stuff that’s discovered in conversation, if we’re talking about something we might veer off and go off on a tangent and talk about something else. So there’s, there’s more things that are, are, are discovered in that conversation that get, gets left out in quick texts. Collier: I, I think that’s right, I mean I had earlier today was with an agent who’s been around the business for a long time, but who I’ve also had a friendly relationship with for all these years. In other words, when we talk via text we, I can know by the way she talked where I needed to go with the, with the thing because there’s that trust factor that’s not there with text, it’s not there with email right? You, you just. Collier: Can’t establish a relationship. Collier: I sensed the trust that I had in her right? It’s, she’s saying get me to this number, I think I can get you across the finish line right? Now, you can read that in text and it gives you a totally different feeling. Collier: And when she says Collier just trust me on this right? She’s telling me something, but if you read those words trust me, I mean you’d be very. David: So listen pick up the phone and have those conversations, don’t rely on text and email, it’s a big deal. Last one, use inclusion strategically, this is basically talking about you know stuff that you just typically throw in like washer, dryer, refrigerator, things like that, you know there’s, there’s and this kinda referencing, a lot of times we’re having home inspections, I’d say you know several times there might be 1,000 bucks, 1,500 bucks worth of small things that. David: We would like done. Collier: Oh, you tell them they have to buy it. David: No, the buyer would like done, the seller doesn’t really wanna fool with us, so hey just give him a thousand bucks, well you know if you’re throwing in, you know say well instead of that we’ll give you a refrigerator that I was gonna give you anyway right? But, I’m holding out. Collier: I didn’t know! That you were to give me a refrigerator. David: I’m holding out the inclusion, so that’s what that’s talking about use inclusion strategically. Collier: Yeah, ‘cause with the first thing we’re asked and think what’s staying with the house right? So. Collier: Let’s don’t automatically put the refrigerator, let’s don’t automatically put the. Collier: Washer/dryer or let’s say you have a flat screen TV that you want it to stay, whatever it may be, or may not be one you wanna get rid of, but if you give me this price guess what I’ll throw in? That new-curved 4K. Collier: Or it could be that Murray lawnmower, we were talking about. David: So, those are some good, good tips on negotiating, so moving on this is the stock segment ok? So, Collier’s been hot on this Carvana, Carbana? Collier: It’s the future, Carvana. Collier: The home of the, if you, you’ve ever been to Atlanta they have a, I bet your dad’s still here, Mr. Arnett you need to go check it out, the vending machine of cars, it spits out cars. David: It just go, go, goes up, picks it up. David: And then brings it down to you huh? David: Well ok, so the stock and we’re gonna, I’m gonna put this, I’m gonna bring this chart up here so you see this, the stock over here and these highs, each one of these highs coming down this way and if you match ‘em all up and it, it kinda has a trend line right? Collier: The ladies are gonna love your nails by the way ‘cause they were. David: Certainly and right here where it breaks that trend line, usually signals that it’s gonna move higher so. Collier: The only problem with his analysis here is that a week ago, I asked him about this and he was bearish. David: Right, but see if you notice a week ago. Collier: I would be, I would be ten dollars a share richer. David: A week ago, we were still banging up against the, the downtrend line so. Collier: Well you, you really did and, and it was based in fact I’ll give you that and you kept saying if this happens watch out. David: Yeah, yeah, it’s, it’s gotta break above that ceiling, but I just think is interesting to know that it keeps; it keeps bouncing up against it. Collier: But there is where we wooow, right there, right there. Collier: That’s where it’s breaking through now. Collier: And Carvana in case you didn’t know, basically the reason you’re seeing a lot of folks, I think a lot of investors don’t understand Carvana because I think, like if you were going to ask my dad. All right, you’re gonna go to your website or go to your phone and you’re gonna order a car, and you’re gonna give them 20,000 dollars, and they’re gonna deliver it to your house and they’re gonna give you 7 days to return it for any reason, he’s not gonna believe you. Collier: Not gonna believe you! Right? That, that you could just have this type of service, but if I were to go ask your daughter and she’d go I believe it, I mean I get Dash, you know all these delivery services already, why wouldn’t I believe it? And quite frankly, she doesn’t, your daughter doesn’t wanna be inconvenienced happen to go to a.
Collier: A place to buy one. David: So check that out Carvana, another one I wanted to holla at today was Snap, Snapchat. Collier: Talked about that a good bit. David: You know we’ve talked about that before, obviously they just at their most recent earnings report, they started to make some money so. David: The stock has moved up and it’s, it’s holding that increase right now, as of 9.80 a share, so looking good there. Collier: One thing, one thing I want to bring up to ya, you know it’s really interesting, over the last week we were watching is there was a good article in the Wall Street Journal about all these brick and mortar companies that we’ve come to, well no, J. Crew, Payless Shoes, Source that we grew up with them, David’s Bridal, Academy Sports. A lot of these big box retail type of stores are having a very hard time staying profitable, because of that real estate that is underlining them, what are your thoughts there? I mean so in other words, from an investing standpoint you gotta be real careful and possibly stay away from a lot of those types of stock, PetSmart was another one. David: Well, I just think it’s a, it’s, it’s a sign of, it’s Amazon, it’s just so much easier to buy something online and get it delivered to your house than to, to go to the store and pay their price, I think nowadays, people feel like they’re getting the lowest price online and. Collier: Well, you know I thought about it with PetSmart you know? If I you know, a big 30 pound bag of Jim Dandy. Collier: Is that old? I guess old school, it’s when we were kids, but anyway you know it’s heavy! So, if I have the choice to getting. Collier: Delivered and they deliver it at least to my doorstep. David: Yeah, 30 pounds of it. Collier: I mean why wouldn’t I? Collier: It’s worth 2 dollars! Collier: But anyway, moving on. David: All right so, we want Anne to show tonight with a, with an article about Warren Buffet, man, he said that when he passes, he wants 90% of his money going into one thing, for his wife, 90%. Collier: She won’t be alive long after he’s gone. Collier: ‘Cause this man is old as dirt right now. David: I mean 90% going into an SNP index fund. David: SNP 500 index fund. Collier: Now one thing I wanted to ask you, you know why is the SNP 500 different from me as an investor in say the Dow, the Dow Jones. David: Well, I think the SNP 500 is made up of, of more stocks obviously the Dow’s only. David: Thirty, SNP 500 obviously more. Collier: Can anybody, how do they find, how do they determine who’s in the SNP? David: Well I think there’s a lot of, there’s a lot of requirements obviously, I think it’s like 50% of the fixed assets in revenue gotta be in the United States, 4 consecutive quarters of positive earnings. Collier: Hey, that’s a big one. David: You know the, the price per share is, is usually I think is, I don’t think there’s many gonna be in there less than 50 dollars, I’m not positive of that but I’m pretty sure the price per share is gonna be up there, they, they gotta file you know their business results. I, I look at it like this, like if you were to, let’s say if you were to pick, like if you had to pick a sports team. David: Like you had to, you had to continually pick. David: The best team every year. David: This would be just like picking an all-star team. Collier: Oh yeah, yeah, yeah, yeah. David: This is like an all-star team because you know they, they make changes to the SNP 500 based on the performance of the company, say they always keep the best in there. Collier: Well I, the reason I was asking that earlier was that I do believe I read where GE was out of the SNP 500 at one point, but was still on the Dow Jones industrial average. Collier: And that’s very important because if I had a, a Dow Jones tracking EFT, ETF I mean. Collier: That I would, I (very short stutter), GE would be weighing me down. Collier: But these guys are gonna kick ‘em out! David: Yeah and I think that, you know one of the biggest things that Warren Buffet was saying is that, you know because this is based on the US, you are betting on America and that’s what he’s doing, he’s saying the best business is still gonna be done in America, because these have to be US companies and I think I’ve read something else that said it rebalances quarterly. So, they continue to change the, the weight of the different stocks in the SNP 50. Collier: So you’re gonna be. Collier: So in essence, they’re gonna diversify it and so, if he’s gonna put 90% of a ton of money. Collier: I mean a ton! Ain’t that fascinating? I mean. Collier: And what he’s doing too he, he doesn’t trust, it goes to tell you he does not trust. Collier: Anybody that he has around him even, to deal with this. David: Thought that that was great! Collier: Well that wraps up another week, man! Big plans this weekend? David: We do have the Chili Cook-off. Collier: With the Exceptional Foundation and Homewood. David: Yeah the, it’s to benefit the Exceptional Foundation, which is a great cause if you don’t know much about them please look that up. Collier: As I said, it’s exceptional. David: Yeah and it’s, it’s a fundraiser for them, it’s gonna be at the Brookwood mall, the parking lot right next to Brookwood mall. Collier: If you like chili, you need to go. David: Yeah, I think it’s from 10:30 to 3 o’clock on this Saturday, March the 2nd, so come down and see us. Collier: And just remember, just remember, the rule is anybody is disqualified if they have beans in their chili ‘cause a real chili does not have beans in it. Collier: It’s true, it is true. David: I don’t know where, I don’t know where you came up with that. Collier: And that’s, that’s like, us chefs know that, I’m very. Collier: Yeah, yeah, while you were on your cruise cruising around, we had a chef on and he talked about it. Collier: Yeah, anyway all right, we’ll see you next Thursday 4 o’clock, same time, same place, don’t forget to follow the podcast, listen to it in your car, wherever you wanna be and you can find it anywhere you can find great. Collier: That’s right, great pod found at Google podcast, Apple podcast, Stitcher, Spotify, all those great places, download it there for your listening enjoyment, all right we’ll see you next week, have a great week!